Long journeys can be taken in comfort, thanks to the increase in length and width of the third generation Superb estate. If an astronaut had to choose a new car he’d go for a Skoda Superb – because there’s so much “space” inside. Schoolboy humour perhaps but accurate. The Superb has built its reputation on its limousine-like dimensions offering passengers the sort of leg room other manufacturers can only dream about, and the latest generation of the car has even more room. Sit in the rear seats and you can literally stretch your legs fully out, ensuring long journeys can be taken in comfort thanks to the 28mm increase in length (23 mm in the estate) and 47mm increase in width in the third generation Superb. And if you want even more space – particularly for luggage – opt for the estate version tested here, which offers a huge 660 litres of boot space with the rear seats upright and 1,950 litres with them folded down. To put it into perspective that’s even more cargo space than in a Ford Transit Courier van. But space isn’t the final frontier where the Superb is concerned. This is now very much an executive model of the highest order, as befits a manufacturer’s flagship. Revised styling, particularly around the front end where the radiator and headlights are lower and wider, has given the car an even more sophisticated, eye-catching look. And inside too the Superb, in SEL Executive trim in particular, offers an upmarket feel with electronically adjustable heated leather seats and ambient lighting, as well as satellite navigation, an eight-inch touchscreen and a powered tailgate. There is a wide variety of petrol and diesel engines now available but my 2.0-litre test car had the beefy 190bhp diesel, mated to a six-speed DSG automatic gearbox. It’s an engine which punches above its weight, offering impressive mid-range performance with instant kick down response although initial acceleration from standstill could have been sharper. Like all modern cars, the Superb has a stop-start system but while most re-start when your foot leaves the brake pedal this car fires only at the point when your foot presses the accelerator, a delay which can be a little unnerving at busy junctions or roundabouts. SE L Executive models give you a choice of driving modes to suit your individual style of driving. You can opt for Normal, Eco or Sport mode or you can set individual preferences for the car’s handling. 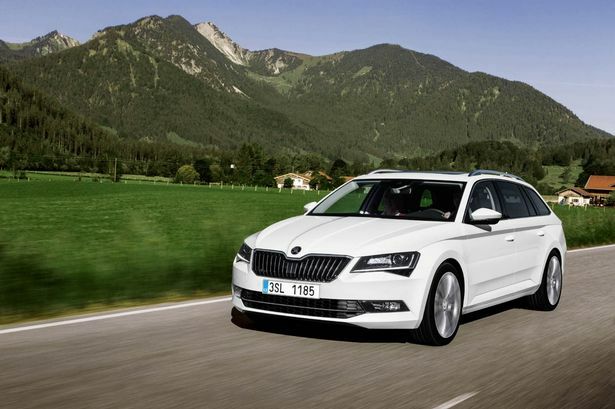 Skoda likes to add that little extra to its Superb models and this car is packed with innovative features. In the previous Superb there was a useful umbrella fitted into the left rear door. In the new model there are umbrellas fitted into both of the front doors, not to mention a magnetic removable torch that re-charges itself when replaced in the luggage area, an ice scraper inside the fuel filler cap and a cupholder which lets you unscrew bottle caps with one hand while you are driving. On the road, the Superb lives up to its name with plenty of power on tap combined with quiet, refined motoring and brilliant fuel economy. It’s ideal – or perhaps that should be superb – for long distance journeys. Mechanical: 1,968cc, 190 bhp four cylinder diesel engine driving front wheels via 6-speed DSG gearbox.